Made from raw and sprouted ingredients. *sprouted almonds, *dates, *sprouted sunflower seeds, *raw cacao, *raisins, celtic sea salt. One of the three new sweet versions from this classic raw sprouted cracker lineup. 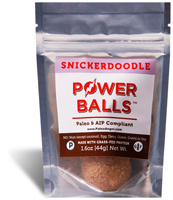 These are now in smaller size pieces in a convenient resealable stand up pouch. Perfect for snacking or dipping.